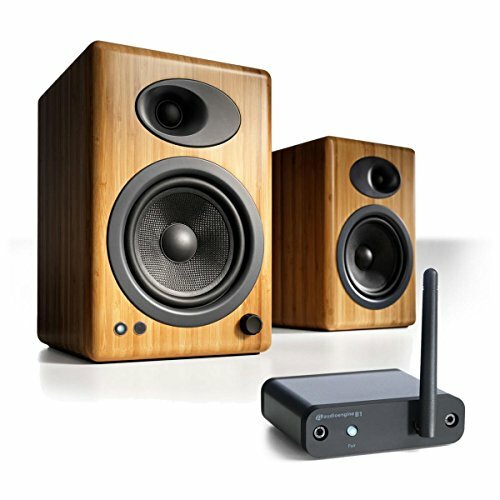 This Audioengine Bookshelf Speaker Package includes:Pair of A5+ Premium Powered Bookshelf Speakers B1 Premium Bluetooth Music Receiver. Audioengine 5+ (A5+) Premium Powered Speakers deliver audiophile-quality sound and features at a price that continues to set the standard for affordable high-quality audio. Connect your iDevice computer TV or any other audio component for great stereo sound in any room. Audioengine A5+ Bookshelf Speaker Highlights:Built-in power amplifiers Remote control Improved thermal management RCA and mini-jack audio inputs Front panel volume control USB power charge port Variable preamp audio output Gold-plated connectors Full-size 5-way speaker binding posts Custom Kevlar woofers and silk tweeters - 5" with advanced voice coils and 20mm silk dome tweeters with neodymium magnets Hand-built MDF wood cabinets - 1" thick Magnetically shielded Advance tuned cabinet with rear-ported wave guide Torroidal power transformers Stand-mount 1/4" threaded inserts Cables included Audioengine A5+ Bookshelf Speaker Features:Affordable Audio: The goal of Audioengine is to provide a high-end listening experience at affordable prices with easy to use high-quality products. The Audioengine 5 powered speaker system was Audioengine's flagship model and has become a best seller. The new A5+ has the same award-winning signature sound as the original A5 but includes customer-requested upgrades and features.Versatile: With custom Kevlar woofers silk dome tweeters and hand-built cabinets the Audioengine 5+ includes a remote control dual audio inputs and enhanced thermal management. You can charge your iDevice via the USB power port and also add a subwoofer to the variable output. Connect Audioengine 5+ to your computer''s headphone jack or pair with a USB DAC to achieve an even higher level of sound quality. The Audioengine 5+ works with any computer and there's no software to install or settings to change.